A flavorful twist on the classic Manhattan. This is just a fantastic name for a cocktail and it makes me happy every time I make one. It doesn’t hurt that the drink is also pretty delicious. According to the folks over at Rye Patriotism, it’s named for President McKinley, who was elected during a time when most politicians had signature drinks, and would often ply voters with them. It seems the cocktail was originally gin-based, and more of a sour. 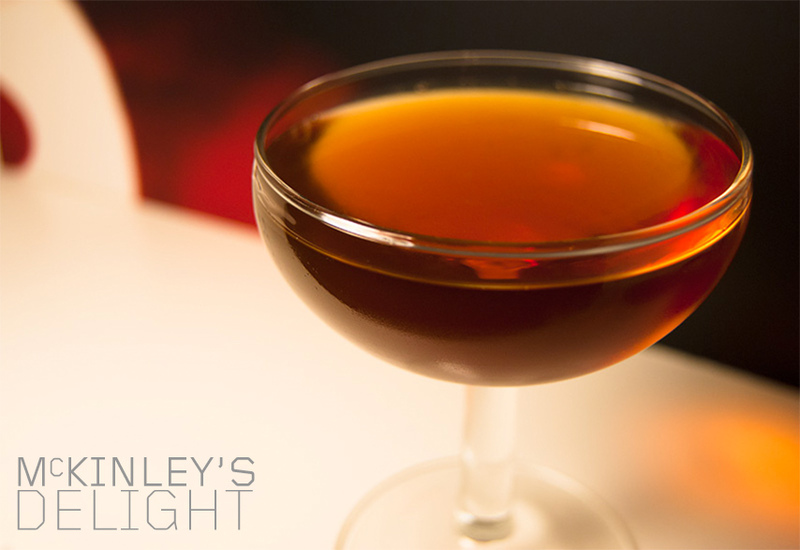 How it evolved into a whiskey drink, no one seems quite sure, but I’m glad it did. One further interesting note: the blog mentioned above is very insistent that this is better as a rye cocktail, and many sources on the web list it as using rye. Yet CocktailDB – which I trust very much since it’s run by noted cocktail historian Ted Haigh – lists it as using bourbon, and also substantially more pastis than other recipes. I went with CocktailDB’s recipe, but there is absolutely no harm in using rye instead, and taking the pastis down to a few dashes. In either case, this cocktail is a nice twist on a basic Manhattan, combining fruit flavors with the herbal notes of pastis to bring a lot of complexity to the drink. The cherry liqueur really adds some brightness that a normal Manhattan lacks. I am currently really enjoying Rothman & Winter’s cherry offering, but you can’t go wrong with Cherry Heering either. Combine all ingredients over ice in a pint glass and stir thoroughly. Strain into a chilled cocktail coupe. No garnish.